Overall, this is an enjoyable film, great for pre-teens and young teens, as well as any lifelong Nancy Drew fan, no matter what your age. Nancy Drew has been around as long as most of us can remember. The famous book character emerged in the 1930s and has undergone many changes throughout the years, keeping up with contemporary culture. Appearing in over 200 books, TV series, and films, the character has maintained popularity throughout the years and now, once again, we are treated to another story of the famed detective in "Nancy Drew And The Hidden Staircase", available April 2 on Blu-ray. Sixteen-year-old Nancy Drew (Sophia Lillis; It) and her father Carson (Sam Trammell; True Blood) find themselves in a new town after the death of Nancy's mother. Nancy struggles in her new surroundings, even finding herself being served with community service after getting caught pulling an online prank. However, things change once she acquaints herself with an elderly woman Flora (Linda Lavin; The Good Wife), who needs help with her haunted home, Twin Elms. Along with Helen (Laura Slade Wiggins; Shameless) - who isn't exactly a best friend of Nancy - and friends, she seeks to find out just what is happening in their rural town of River Heights. They quickly learn that not everything is what it seems. Sophia Lillis is definitely the standout in this film. Not only because she plays the title character but because her performance is what really draws you into this film and its story. She is easily believable as the smart and sassy Drew. Previously mentioned Slade Wiggins, Mackenzie Graham(Darlin'), who plays Bess Marvin(Jinn), and Zoe Renee, who plays George Fayne, also give noteworthy performances. The 1080p video quality is the standard and the picture presents nicely for the level of technology. It is crisp and clean and the blacks are true. Overall this is a solid transfer. The DST-HD high definition audio quality is also pretty good. The dialogue can be heard clearly and the ambient sound enhances the viewer's experience. It gets the job done well and with a film such as this one that is what matters. "A Sleuth, A Girl, And An Inspiration"- This feature is a look at what went into making the film including interviews and film clips, as well as character discussion, and the history of Nancy Drew. "Pink Footprints: Touring Twin Elms"- take a better look at Twin Elms while listening to some info from cast and members. Overall, this is an enjoyable film, great for pre-teens and young teens, as well as any lifelong Nancy Drew fan, no matter what your age. It's also a wonderful way to introduce the character to a new generation of readers and filmgoers. Be sure to pick up a copy! 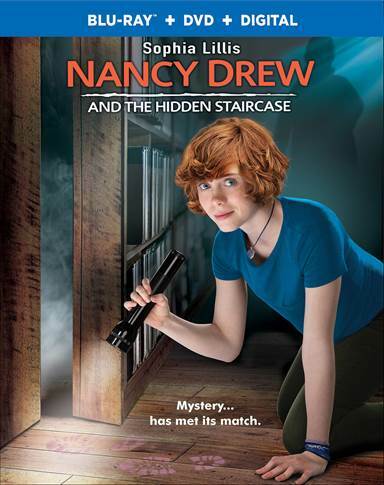 Download Nancy Drew and the Hidden Staircase from the iTunes Store in Digial HD. For more information about Nancy Drew and the Hidden Staircase visit the FlickDirect Movie Database.